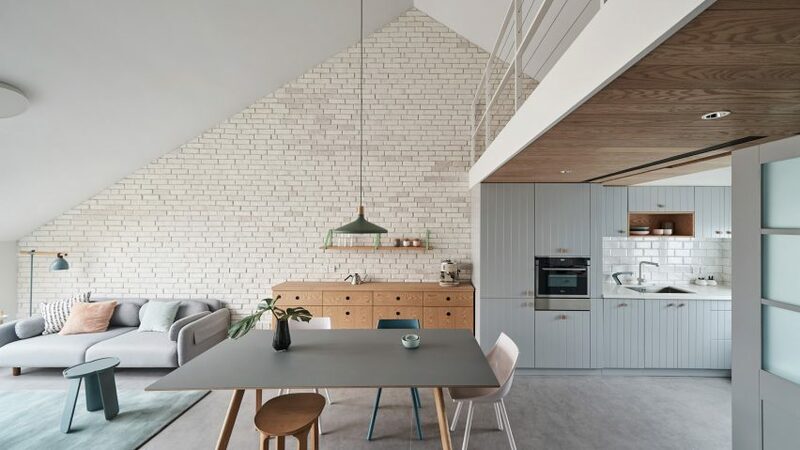 HAO Design took advantage of this apartment's peaked roof to turn it into a bright and spacious family home, finishing its interiors with a selection of pastel furnishings. Starburst House is set within the city's Haidian District and belongs to a young couple and their son. 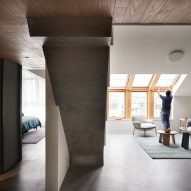 The apartment – which measures 116 square-metres – was purchased as an empty shell, with its steeply slanting roof being the only stand-out feature. 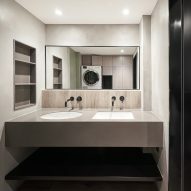 The bare space was handed over to Taiwan-based studio HAO Design to be transformed into a family home that would suit the client's "open-ended, unfixed, and flexible" lifestyle. 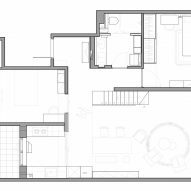 Keeping the rest of the brief simple, the husband, who works from home as a software engineer, and wife, who is an architecture editor, solely specified that a study should be included in the floor plan. 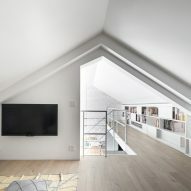 HAO Design decided to preserve the apartment's asymmetrically pitched roof, allowing them to insert a mezzanine that plays host to the child's bedroom and a secondary bathroom. "[We] believed that the construction of the ceiling, despite its difficulty, was actually [the home's] most beautiful area," the studio explained. 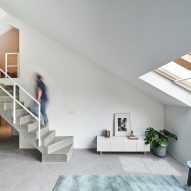 Accessed via a set of chunky concrete steps, the upper level features integrated shelving that runs the entire length of the wall. A light timber desk has also been slotted into one corner to provide the clients with a small work area. 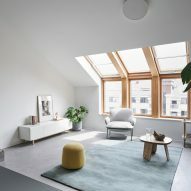 On the ground floor there is an open-plan living area, which has been dressed with a grey sofa, baby pink dining chairs, and mint green pendant lamp. Light hues have been applied in the kitchen, which has pale blue cabinetry and a white tile backsplash. 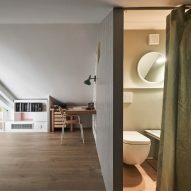 Here the studio has installed a set of sliding doors that can be drawn back and forth to offer different levels of privacy. The wall that separates the kitchen from the playroom has been fronted with a panel of chalkboard where the client's child can draw or write messages. Inside, the playroom has a series of mountain-shaped wall cushions that echo the form of the property's roof. A bright orange curtain with cut-out windows has also been put up at the room's rear to create a small play fort. 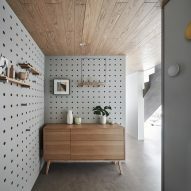 This lower floor also accommodates a perforated entryway and the master bedroom. HAO Design has previously converted a skinny Taiwanese townhouse into a furniture store and turned a 1980s townhouse into furniture shop and cafe in Taiwan.